Books: I checked out some new slow cooker books along with “Little Women” (which I just realized is almost 500 pages long! Oops, I have a week to finish!). The library presentation is at Corporate Parkway Library on May 5th here in Wentzville MO if anyone is interested. It is how to “Make Your Favorite Foods Healthy” and part of the St. Charles Library Modern Parenting series. 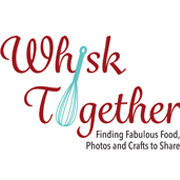 See the website for more details – it is free as usual and we will make a recipe to take home and try! Here is the link to sign up. Go to Programs and Calendar of Events. They do fill fast sometimes. Recipe: Berry season is here in Missouri next month! Woo hoo!!!! Strawberries are my favorite food EVER. 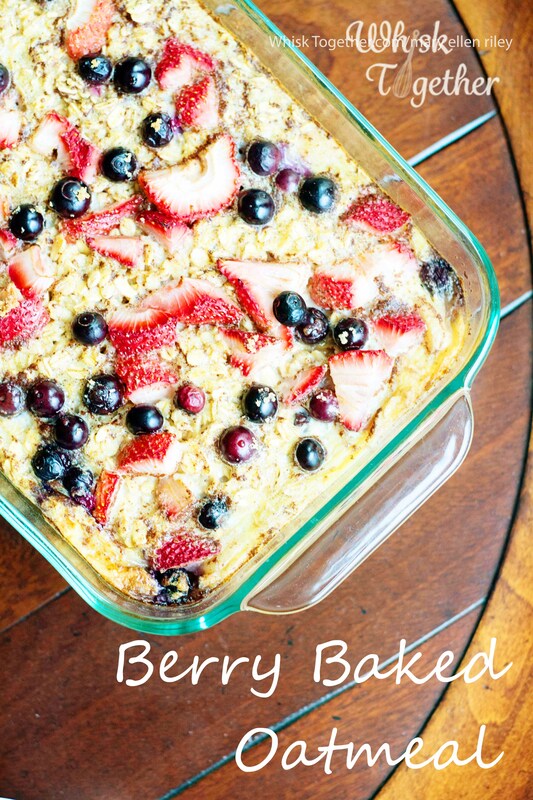 Here is another version of the Baked Oatmeal that Juliana and I eat every other week when we have extra time in the morning. Or, prep this in the evening and just pop it in the oven in the morning! 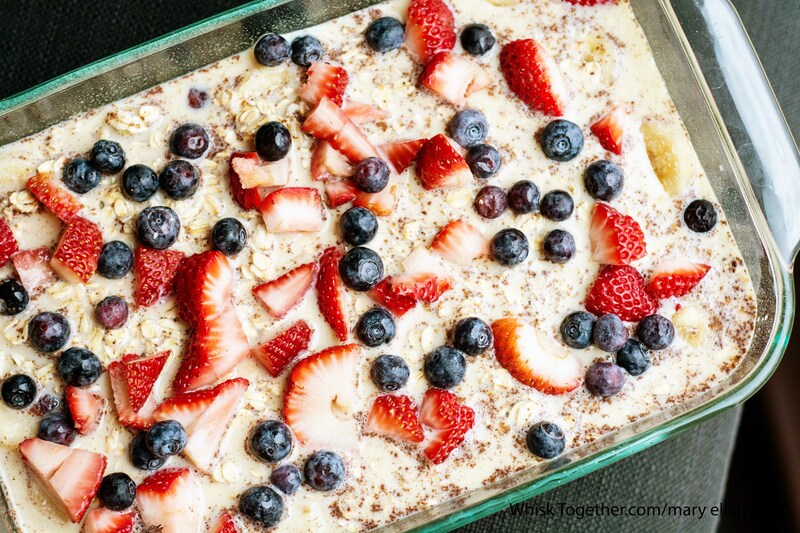 It will bake while you get ready for work and have a hot, delicious breakfast all ready to go. Feel free to change the berry though. We just got a bunch of fresh raspberries at the produce stand for $1 a box and will substitute those next. A friend posted on another blog post that she used raspberries and peaches. **Update** I have substituted almond milk for cow’s milk in several baked oatmeal recipes and it works! I used use unsweetened vanilla almond milk. Spray a 7×11 or 9×9 or 2 qt. casserole dish with baking spray. Sprinkle half the berries on the bottom of the dish. In a great big bowl, mix the dry stuff: oats, cinnamon, baking powder, and salt. Add the wet stuff to the dry stuff: milk, eggs, honey and vanilla. Stir until mixed well. 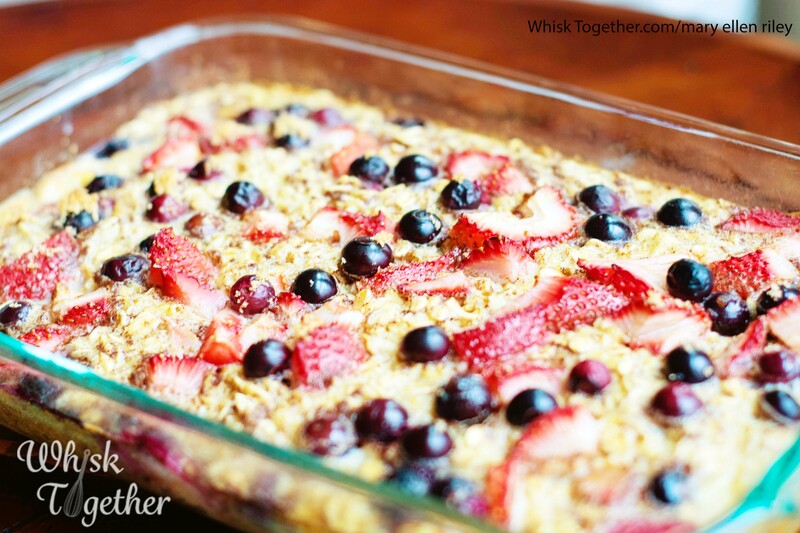 Dump the oatmeal mixture into the pan over the berries. 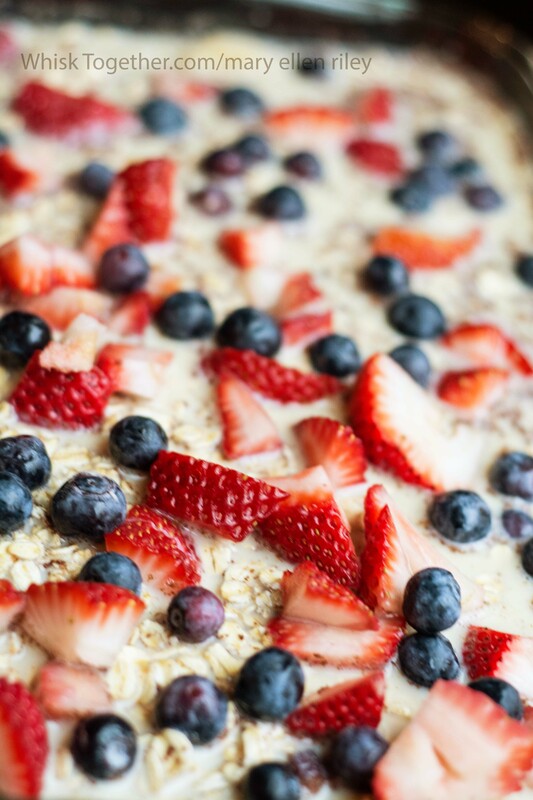 Sprinkle the rest of the berries on top of the oatmeal. Sprinkle the nuts and brown sugar on top. Pop in the oven for about 30-35 minutes. The middle shouldn’t jiggle once removed from the oven when you shake the pan. Serve warm with more brown sugar, maple syrup, warm milk or plain.